The resignation of David Creech sparked an uproar in Scarborough this year that led to the recall of three school board members. The Winthrop School Committee has hired a former Scarborough administrator who was at the center of a major controversy this year to serve as interim principal of Winthrop High School, filling a position that opened this summer. David Creech started the job on Aug. 16 after his predecessor, Sarah Landry, spent just one school year as the high school’s principal. In June, Landry accepted a job as the principal of Sylvio Gilbert Elementary School in Augusta. In February, Creech sparked an uproar in Scarborough when he resigned as principal at Scarborough High, then said that the district’s superintendent, Julie Kukenberger, had forced him to quit or be fired. At one point, Creech unsuccessfully tried to rescind his resignation. Parents and teachers in Scarborough who backed Creech expressed dismay about the outcome. Many families had come to the principal’s defense, and his lawyer suggested that he was being forced out because he backed staff members who disagreed with new district policies on proficiency-based learning and school start times. In May, Scarborough residents, angered by the way Creech had been treated by school officials, voted to recall three Board of Education members. Donna Beeley, Cari Lyford and Jodi Shea were removed from office by wide margins. Creech did not respond to a phone call seeking comment Monday, but his wife, Michele Bellfy Creech, responded on Facebook to an outpouring of support that was expressed last week and this week on social media. The Creeches live in Kennebunk, where he was a high school teacher and assistant principal before he went to Scarborough. On Facebook, the reaction to Creech’s being hired in Winthrop was a mix of regrets that he has moved on and anger at how the Scarborough school district handled the controversy. “Congratulations, Winthrop. You just won the lottery with this amazing man as your interim principal,” Karen Loisel wrote on the Facebook page of the Road to Renewal. “Winthrop High School is so very lucky to have this incredible leader. I’m so grateful that the Winthrop superintendent was willing to see through all this mess and give Dave this opportunity,” added Amy Johnson Glidden. “Huge loss for Scarborough, but a big gain for Winthrop,” Karen L. Lafferty posted. Scarborough has tapped longtime assistant principal Susan Ketch to be interim principal for the 2018-19 school year. Another citizens group in Scarborough that was formed to support Creech – Scarborough School Supporters Advocating for a Start Times Plan Compromise – also weighed in. “The Winthrop, Maine School District gets it! They will not let an amazing leader pass them by. Congratulations to Principal David Creech, who continues to be greatly missed in Scarborough. We wish you much success after the turmoil and upset experienced this past year,” the group said in a Facebook post. 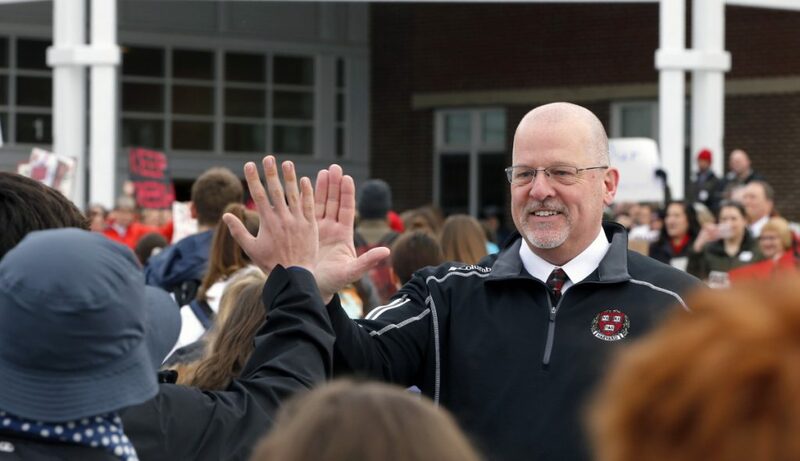 Some Facebook commenters took Creech’s departure one step further, expressing hope that he would apply for a superintendency job in SAD 75 in Topsham. “We have an interim superintendent for one year. Maybe Mr. Creech will be ready next year,” one commenter wrote. He has a master’s degree in education leadership from the University of Southern Maine and has worked as a mathematics teacher at schools around southern Maine, she noted. He also has coached basketball, cross-country, and track and field. For the last 17 years, he has worked as a high school administrator and was a finalist for the principal’s position at Falmouth High School before the controversy erupted in Scarborough. Creech will receive $76,000 for the 189 days that he works for the Winthrop School Department during the current school year, according to his contract. Creech’s annual salary as principal of Scarborough High was $112,238. The Winthrop School Committee voted unanimously on Aug. 15 to hire Creech. Virginia Geyer, chairwoman of the committee, did not respond to a phone call Monday. Brown said that she was not concerned by the circumstances under which Creech left his Scarborough job, and she referred to the committee’s unanimous vote as evidence of its support for him. The committee originally offered to hire another person for a permanent principal’s job, but after that person declined the offer, the committee decided to advertise for an interim principal, Brown said. The advertisement attracted four applicants. Officials were impressed by Creech during his interview, and his references spoke highly of him, Brown said. On Tuesday, Creech plans to hold an informal meet-and-greet with families at 5:30 p.m. in the Winthrop High School cafeteria. Clarification: This story was updated on Aug. 28, 2018, at 12:55 p.m. to include Creech’s salary while at Scarborough High School.